TierraCast has recently released a new collection aptly called Dulce Vida (Spanish for sweet life). 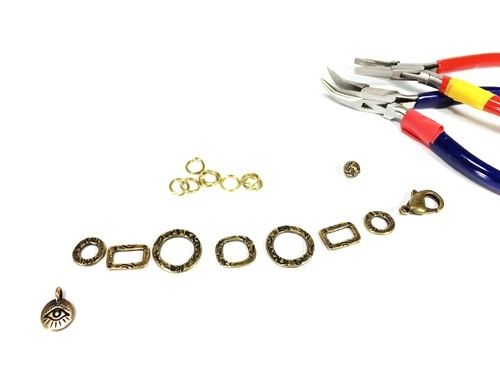 What could be sweeter for creative souls but to spend the days of their lives making jewelry? 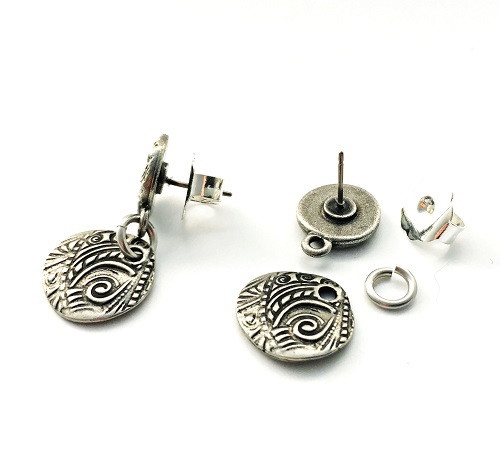 TierraCast makes high quality, lead-free cast pewter charms and components in northern California. Note : they are wholesalers but you can easily buy their components from various retailers like Fire Mountain Gems. 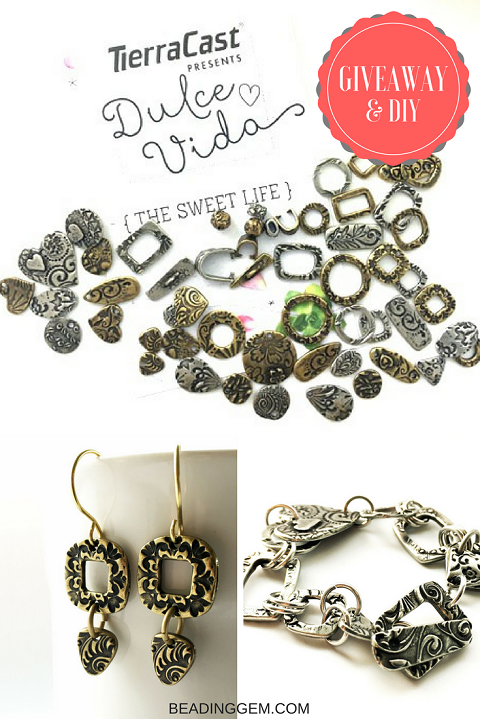 I received samples from the Dulce Vida collection as well as their latest charm designs for review. I've bought pewter charms for years but none can beat the quality of those from TierraCast. Well designed and well made. 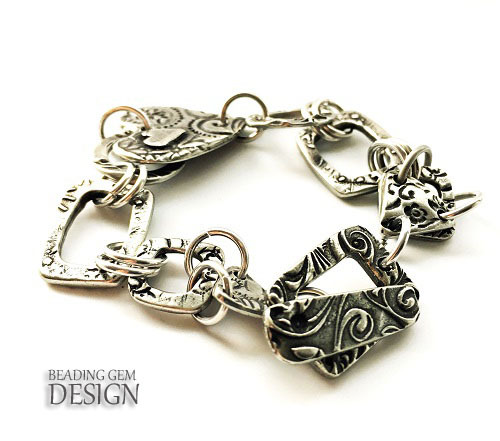 The Dulce Vida collection designs are clearly inspired by nature. 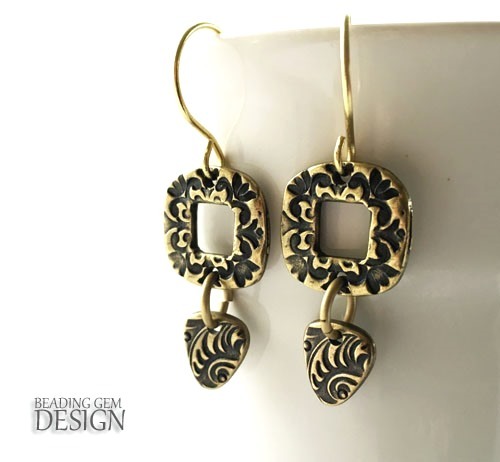 They are dark in tone as they have been antiqued in just two tones - antiqued pewter and brass plated pewter. I wonder why they didn't do this collection with antique copper? That metal color would look great too! What stands out is these pieces are all double-sided as you can see in the pairs I have laid out below. So you could make reversible jewelry. Or mix and match the designs by simply flipping over the components. I think it was a clever idea to be able to extend your design options in this way. Some of the components are slightly domed so these may not be suitable for actual reversible designs but the finish on the back will be far more interesting than the plain variety. The larger components also had raised elements giving these the look of riveted pieces. I was momentarily perplexed when I saw these. You can guess what they are, right? (Answer below if you don't). I had fun designing some easy pieces using the Dulce Vida. I simply linked the components together with jump rings. 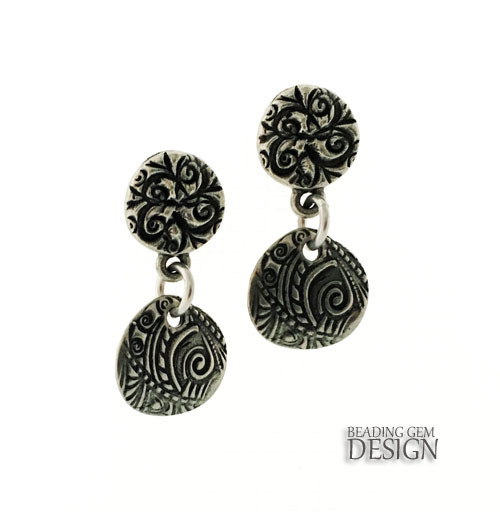 But really, the collection's toggle clasps were perfect for what I had in mind - the round toggle clasps as well as the rectangular jardin designs in both colors are just lovely. 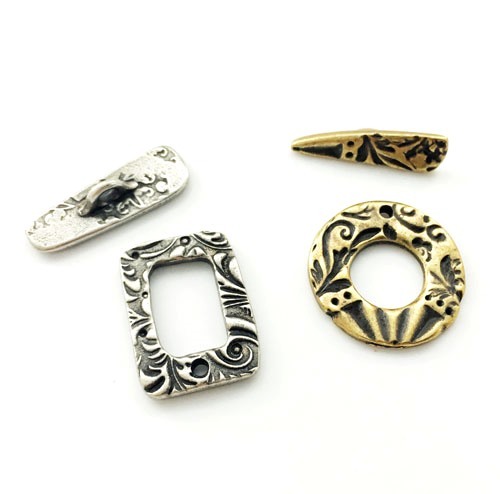 Also check my past tutorial on how to wire a toggle clasp into a pendant! If you do, just be aware some slight modification of the wiring path is needed because the metal loop on the bar is situated differently in this case. Whenever possible, double up jump rings for extra security. I went with 3 rings purely for looks! Also consider thicker gauge jump rings. These were all 18 G rings. Also note the smaller ring at the bar end of the clasp. That was necessary to enable the bar to go through the other side as the jump rings I was using were a little too big for the toggle interior. My favorite piece from the whole collection was the Heart charm. 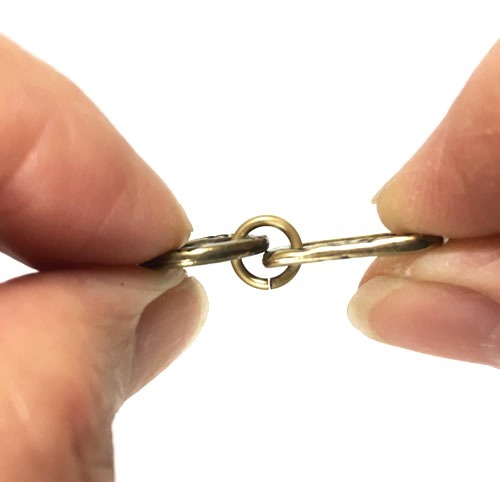 Rather than using their double holed connectors, I made this charm into a connector by simply punching an extra hole. 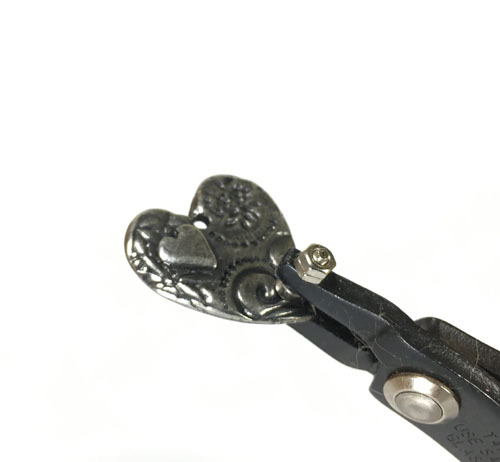 If you are a beginner, you will find this simple pliers punch a useful tool for expanding design capabilities. I find the 1.8 mm hole puncher more useful than the smaller 1.25 mm one. Some light filing is necessary to smooth down the metal. 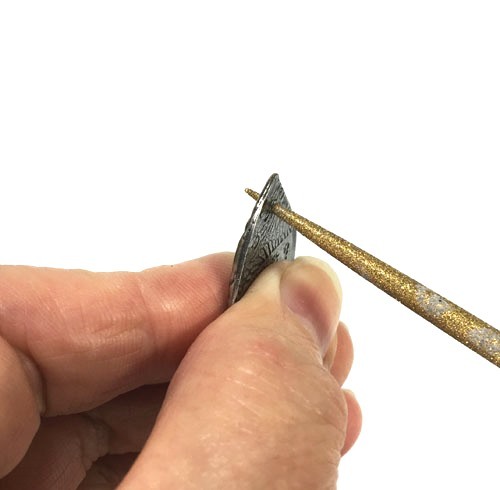 You can easily get some inexpensive needle files from your local hardware store. 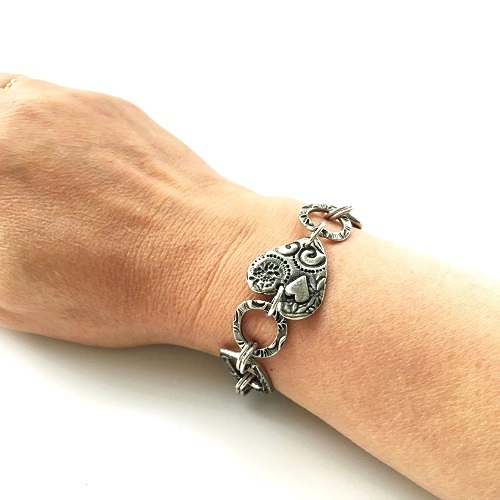 Both the toggle and the heart charm made this bracelet pretty! This is definitely my new favorite bracelet to wear! I like my toggle clasp bracelets to just fit rather than be looser (and run a risk of becoming undone). Those strange components were studs with the posts folded down for shipping! So I took my chain nose pliers and gently straightened the posts to where they should be. I also prefer to use post backs or ear nuts with a generous surface area. These are more comfortable to wear and you are less likely to drop them when putting on the stud earrings. Been there, done that. 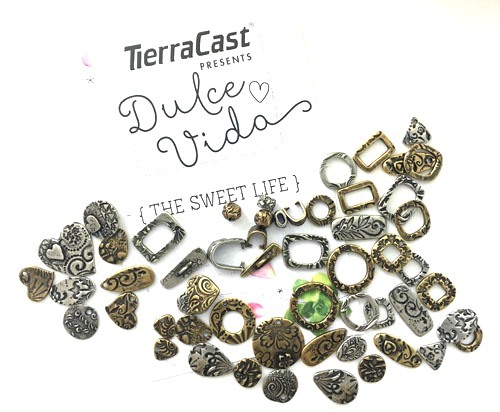 If you'd like to win your very own collection of TierraCast's Dulce Vida components for your jewelry designs, please make a comment below. Make sure you leave contact info below if you do not have an online shop or blog. It ends in a week's time at 6 pm EST Monday, June 5, 2017. I will pick the winner randomly and announce the results as soon as possible after. So be sure to leave a contact email if you don't have an online link or make sure you come back and check! Otherwise I will redraw in a week. Good luck! Ooh so much tierracast goodness!! I'm a blog follower, subscriber and Facebook fan, can be reached at retro-grrl@hotmail.com, fingers n toes crossed!! Love, love, love! Please throw my hat into the ring (pun intended)! These new findings certainly stimulate the creative juices. Would love to play with them. Thank you for your comments. I can see why this line is called dulce vida these components are rich and beautiful. I would love to have My hand at creating with these. Thanks for the show and tell and for the giveaway. I love your blog and look forward to it being in my inbox! I love TierraCast components, Pearl.Sturdy, functional, and beautiful. And always coming out with new things to play with. would love to win. TierraCast has great components. I would be so extremely grateful to win this collection. Oh wow! I'm in love with these components! These will be awesome to work with! Those would be so much fun to work with. I'll have to look for them. That is a great observation, Divya. Yes, they do have the metal clay look about them without the work and having to use a torch or kiln! Wow these are fabulous. If I don't win these, I will definitely be buying some. Love the bracelet! These look fabulous! I got a lot of ideas just from looking at the pictures. Wow...the details on the components are gorgeous ! Pick me...pick me! Thanks Pearl! Long time TerraCast user! Especially love the designs and the color of this Dulce Vida Collection!! Would like to have this prize to create something different and beautiful! These are lovely. I have always been impressed with the quality of the Tierra Cast findings. I would love to put these in my jewellery. These are amazing! Your use of them in your designs is fantastic too. Would love to win. Love! Especially the earring possibilities! Thanks for showing these - they really are very interesting. Now to find them in the Fire Mountain catalogue/website. Are they under a specific name or randomly scattered? Hi Bonnie, You can search there under TierraCast - here is the link to use http://bit.ly/2s6TlY2 (affiliate link). Their products are all beautiful and high quality. 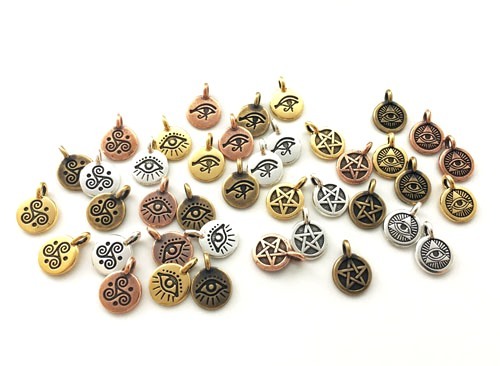 I have used a few of these charms already and they really are nice. I especially like the brass color....it feels warmer to me than silver. I also like the fact that they are two sided....a useful design feature. Too many ideas whirling in my mind. Thank you Pearl. Subscriber: zoowatcher10@yahoo.com. I have very few components in my supplies for beading and wire work. Thanks for he chance to win. I have two favourite component designers and Tierra Cast is one of them. As you say - the quality of their components is excellent and their designs are definitely drool worthy. The fact that these components can be used alone or by adding one other piece is a huge draw for me. I often find that customers prefer a simple elegant piece rather than something intricate and highly embellished. I'm delighted to see the earring studs as well. 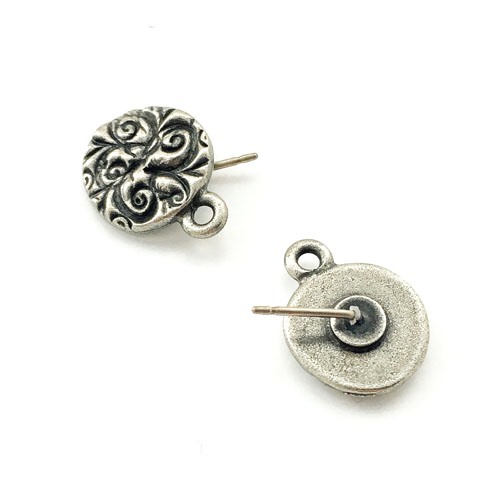 It's not easy to find a quality earring stud that is different from the herd...always my go-to... something different - so my jewelry can stand out from the crowd as well. Lots of ideas in this post! Pearl, your creativity and Tierra Cast!s pieces make for beautiful pieces. I agree with the post above that these pieces look like metal clay. I am a blog subscriber and a FB follower. These Tierra Cast components are Delicious! I would love to win them.. Jean.Gimena@gmail.com please and thank you. With all the stuff that Terracast sells, you would think that they would run out of fresh ideas- wrong! I love the heart and other domed pieces. I especially love that they added the element that makes it look more 3D with pieces sticking out. Just reading the review and seeing your creations made me think of a ton more possibilities. I would love to win this collection so I can create some new beauties. 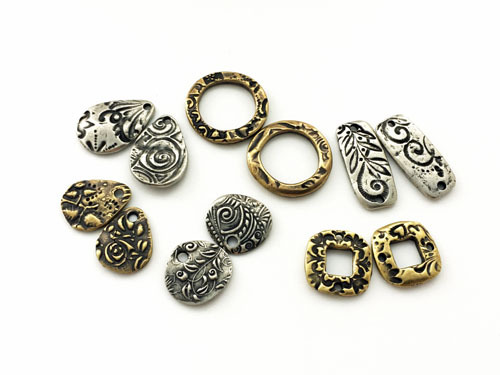 Love Tierra Cast quality and this new line - reminds me of Precious Metal Clay! Findings are just adorable! Creations are awesome. Can't wait to create! This collection look amazing! I would love to win this! I'm already designing in my head. And Pearl, your creations are beautiful! Beautiful components. Thanks for reviewing them and for giving us a chance to win some. I enjoy your blog very much. Wow! Love the collection and would love to win this. I get excited when you make things to spark our creativity. 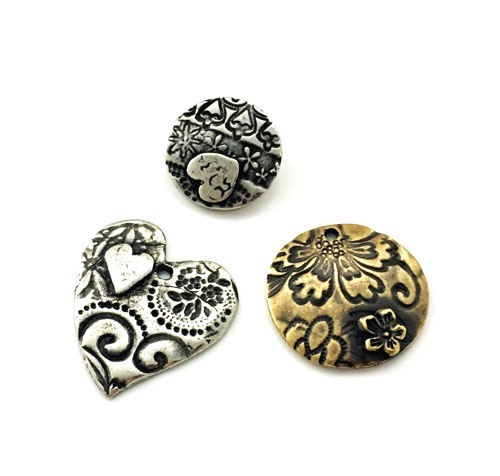 The TierraCast Pewter charms are some of my favorites and this collection will also be some of my "Sweet" enjoyable supplies. Thanks for the chance to win this collection. I also appreciate the handy hints you share when doing your reviews. A winning product and a Winning blogger. These are really nice components. they would work in many designs. So many lovely goodies to create some amazing pieces. Thanks for the chance to win. I LOVE these, especially the heart too. thanks for the opportunity. It's been awhile since I won anything online. I would REALLY LOVE to win this one. This stuff is just my style and I have so many design ideas going thru my head already!!!!! Your bracelets and earrings look great! I can't wait to get some of these to play with.I shared it on facebook. Thanks for the opportunity to get some to try. OOOHHH! Those are so pretty! I already have ideas popping in my head for them in my jewellery designs! Would love to win these! They are beautiful. I follow the blog and also on FB. I thinks it's just fantastic that these components are double sided. 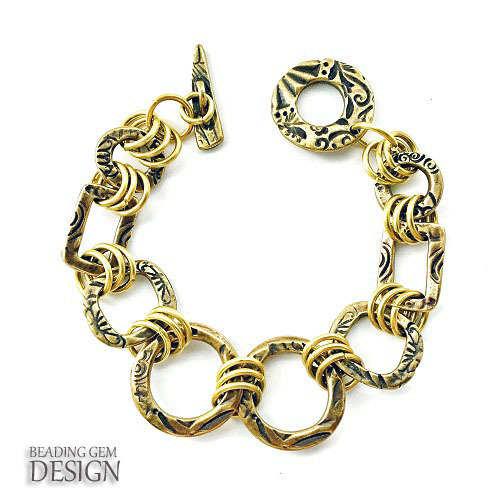 No more worrying whether or not the piece is on the right side, when making it, and when wearing it! Great job featuring these. Just wish we could byt them out right from the company. I'd love to win these components! So pretty! I really like what you did with them, but do have some ideas of my own! I follow you on Feedly (reader). Too late for the giveaway but these look so cool! I love the style and versatility of it. Yikes! You are not too late. I got the date wrong. So I have updated the post to show the end of the giveaway is actually June 5. I am so happy to see that I am on time to enter this contest. I love these components and i love terra cast so much. Love this new collection! It would be a sweet life indeed were I to win this giveaway! Thanks Pearl, I love all of your blog posts! Love Tierra Cast! Thanks for the giveaway - already thinking of how to combine them with the rest of my stash.